What is your favourite leather colour for a Travellers Notebook? 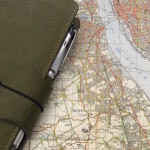 Is there a Question you would like to ask our readers about how they use their Travellers Notebooks? Like all things notebook the answer is never straightforward. I have four genuine Midoris, two of each size but four different colours because, well just because. RS in brown and PanAm Blue, and PP in black and camel. Currently I use the RS brown and PP black. My favourite is black, at the moment. I like browns that can patina, and can show use and age, so camel and brown in original midori. Oh, that’s like having to choose your favourite child… My favourite TN (functionally) is brown. But I also have a fabulous teal coloured one and a red one and I love them all. I like the dark brown for every day carry, but sometimes I need the bright yellow color of my special personal TN, to put some sunshine in my life. I really like toffee browns or black for TN’s.I tend to stick to classic neutrals.